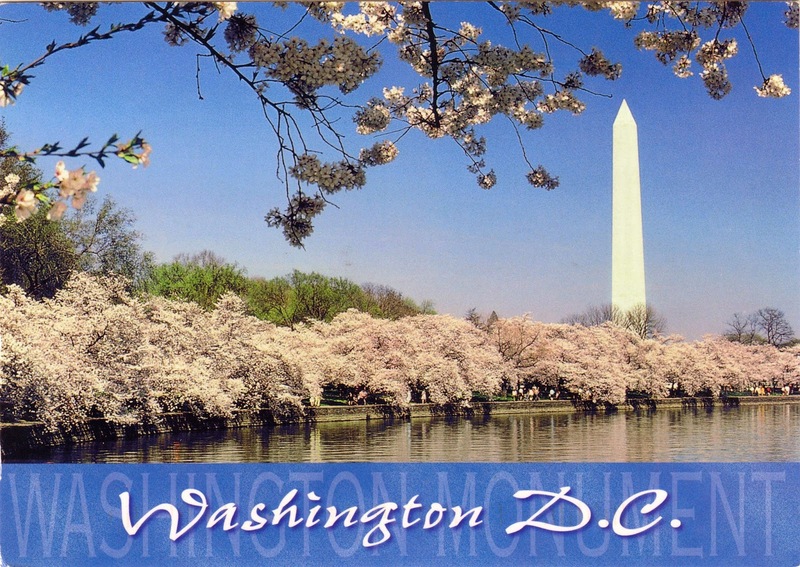 Postcard US-2643460 from Washington D.C. area shows the famed cherry blossoms around the Tidal Basin with the Washington Monument in the background. The 2014 National Cherry Blossom Festival runs from March 20 to April 13, commemorating the 102nd anniversary of the gift of the cherry blossom trees from Japan. The peak bloom period only lasts for a few days; and the precise time period varies each year depending on weather conditions. The average peak bloom date from 1992 to 2013 for those cherry trees is March 31. However, the colder-than-usual winter is causing a late peak for cherry blossoms this year. The National Park Service forecast put the peak bloom period for the cherry blossoms this year as from April 8 to April 12. An alternative forecast by Washington Post‘s Capital Weather Gang predicted a peak bloom period between April 11 and April 15, centered on April 13. Meanwhile, you can watch the live cherry blossom cam on Earthcam.